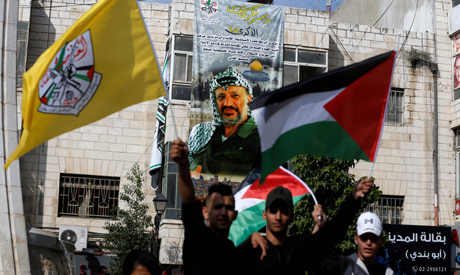 Palestinians on Sunday marked 14 years since the death of iconic leader Yasser Arafat, with their campaign for statehood still deadlocked and beset by internal divisions. Arafat, who for decades embodied the struggle for independence, died aged 75 in a French hospital on November 11, 2004, with fellow Palestinians accusing Israel of having poisoned him. The Israeli government firmly denies the allegation. His body was exhumed in 2012 for tests but a subsequent French investigation found no proof of poisoning. Swiss experts, however, said they found high levels of radioactive polonium on his personal effects. Arafat's successor, Palestinian president Mahmud Abbas, laid a wreath at his tomb in Ramallah in the Israeli-occupied West Bank on Sunday, flanked by senior officials of his Palestinian Authority. After paying tribute to "the leader of the nation and the leader of the martyrs", Abbas went on to accuse Israel and the United States of seeking to sabotage Palestinian statehood through a nascent peace plan that President Donald Trump calls "the ultimate deal". "There is an American conspiracy through the ultimate agreement and the Israelis are conspiring to implement it," he said. Abbas suspended diplomatic contact with Washington following Trump's 2017 recognition of the disputed city of Jerusalem as capital of Israel. Palestinians claim the Israeli-annexed eastern part of the city as the capital of their future state. Abbas added that the Islamist Hamas movement, his bitter rival which rules the Gaza Strip, was also hindering the cause. "Another plot, by Hamas, aims to disrupt the establishment of an independent Palestinian state," he said. Hamas seized control of Gaza from Abbas's Palestinian Authority in a 2007 near civil war.